RE/MAX Elite Reaches their goal of $10,000 for 2018's Month of Miracles! 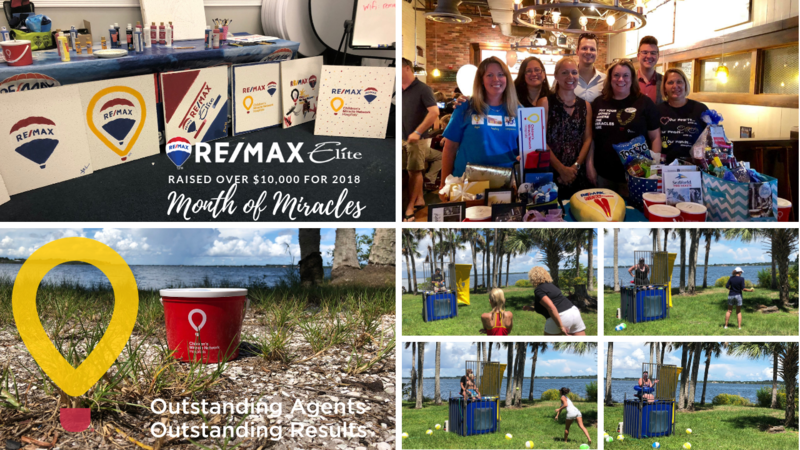 MELBOURNE, FLORIDA, Sept 9, 2018 – Inspired by a 25-year-long partnership between RE/MAX and Children’s Miracle Network Hospitals® (CMN Hospitals), RE/MAX Elite is proud to celebrate the seventh annual Month of Miracles throughout August by hosting several fundraisers and events. This is the 12th year the office has increased awareness for Children's Miracle Network at Orlando Health Arnold Palmer Hospital for Children the local CMN Hospital. RE/MAX Elite held a Miracle Month kick off Party Doughraiser at Uno’s Chicago Grill on August 1st, a Ceiling Painting Tile Party mid month and our final event was at our Annual Family Fun Day where we did our first Dunkin for Miracles event where each of our Management Team took a turn at getting dunked. Throughout the RE/MAX Elite’s fundraising efforts, we were able to reach out $10,000 goal for this year’s Month of Miracles. RE/MAX Elite has donated more than $250,000 since opening the doors in 2006. Since 1992, RE/MAX Affiliates across the U.S. and Canada have raised $157 million for 170 member hospitals. RE/MAX Miracle Agents, Offices and Teams are dedicated supporters who pledge to make a donation after each closed transaction. Although funds are donated throughout the year, August serves as a reminder to Brevard County residents that healthy communities – and especially children – matter to RE/MAX Associates. Homebuyers and sellers also are able to participate in the celebration. A RE/MAX Miracle Home or commercial Miracle Property is identifiable by a rider on top of RE/MAX yard signs. Homebuyers and sellers are also able to show their support by requesting that their home be a Miracle Home. Many homes on remax.com are flagged as a Miracle Home with a CMN Hospitals yellow and red balloon icon. RE/MAX ELITE was founded in 2006 by Justin and Breanne Brown. In a few short years the office has grown to become the #1 RE/MAX in Brevard County (since 2009) by providing superior support services to over 100 experienced full-time real estate professionals. RE/MAX ELITE is part of a network that has over 123,000 Sales Associates in over 100 countries and territories. This is an international presence greater than any of its competitors. Their offices are located in Melbourne, Cocoa Beach, Merritt Island, Indialantic and Palm Bay Florida. RE/MAX ELITE is proud of its Premier Community Citizenship, which has helped raise over $250k for deserving organizations like Children’s Miracle Network Hospitals and Brevard’s Children & Families in Need.